12% Off Vitacost Orders through 12/02! Chocolove Chocolate ($2.59-3.19 each, minimum purchase 2) – I absolutely love this stuff, and plan to tuck a bar into each stocking. My favorites are the Almond & Sea Salt and Cherries & Almonds! Rigoni di Asiago Nocciolata Organic Hazelnut Spread with Cocoa and Milk ($5.19 each, minimum purchase 2) – this is my favorite Nutella alternative. It’s organic, creamier and sweeter than Justin’s, and does not contain palm oil like the original Nutella. Also, a little less calories and half the saturated fat of the original! Definitely something for my little niece’s stocking. Quinn Foods Popcorn ($5.39 each, some flavors have a minimum purchase of 2) – one for the adults! This delicious gourmet microwaveable popcorn is headquartered not far from us in Woburn, MA. Each pack comes with two envelopes – one with oil and one with flavoring. You pop the popcorn first, then add the oil and shake, then add the powder and shake. End result is absolutely delicious, and the Olive Oil & Herbs flavor is my favorite. Alba Botanica Papaya Enzyme Facial Mask ($8.69) – I have been using this stuff for a while, and think it’s a great non-abrasive exfoliator/peel. Getting this for my sister in law who loves all things natural/organic. Thayers Alcohol Free Witch Hazel ($7.96) – it took me a while to try the Thayers Witch Hazel, and I have been loving it ever since. This is going into my mother in law’s stocking. My original Vitacost vs iHerb post is definitely the most popular page on my blog, and I’m incredibly happy that people are finding it useful even though it was put together quite a while ago! I’ve since placed many orders on both sites, and am planning to put together an updated overview (things have definitely changed quite a bit), but in the meantime I thought I’d put together a very quick price comparison of the two. Basically what I did was fill my cart with the exact same items that I was planning to buy, and take a screen shot of the resulting cart and total price. 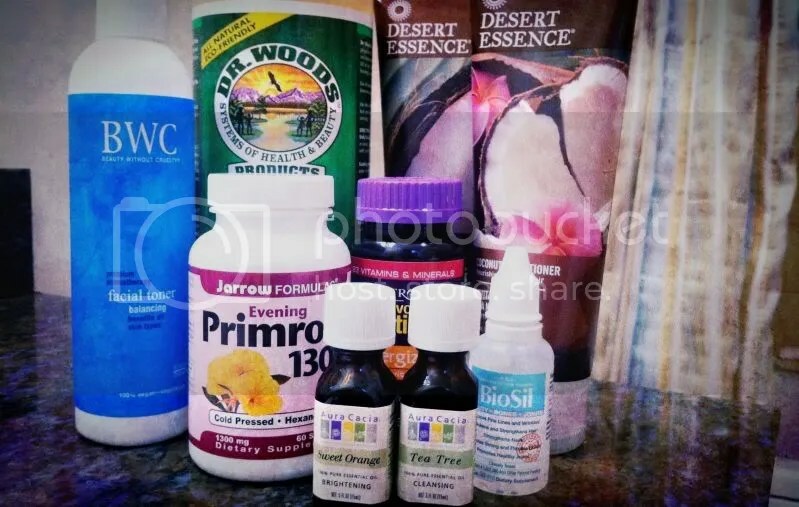 I will also once again share my iHerb discount code (VMC661) that will save you $5-10 off of your first order, and a Vitacost link (or bit.ly/Xn43SB if that doesn’t work) that will give you $10 off of your first order of $30 or more. The products in both carts are actual things that I buy, so I wasn’t picking and choosing based on the price difference or to prove a point. 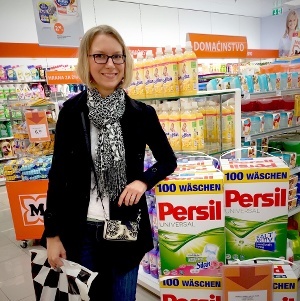 However, the results were pretty amazing – while I always knew that Vitacost was less expensive, it was pretty impressive to see just how much lower their prices are! My Vitacost cart: $73.55 total! 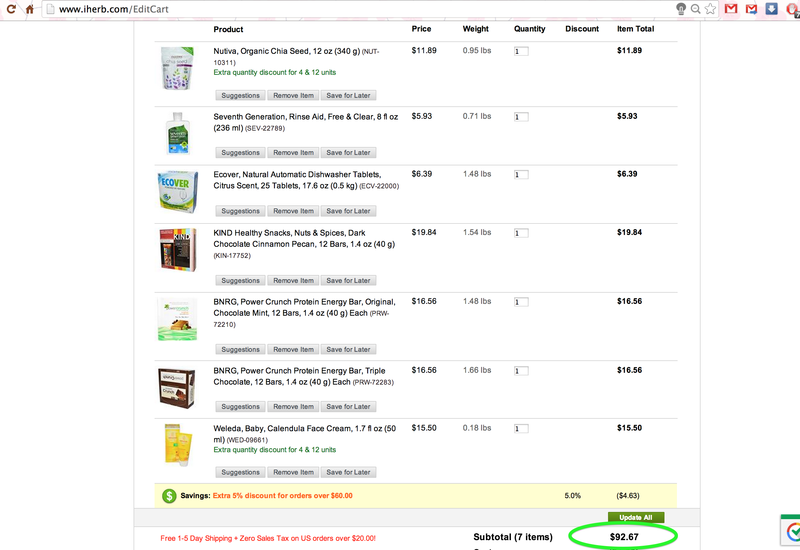 So as you can see, the iHerb order came to $92.67, while the Vitacost order was just $73.55 – that’s almost a $20 price difference, $19.12 to be exact! Both orders would be eligible for free shipping, however only the Vitacost one would get you an extra 4% cash back through ebates (sign up here if you don’t already have an account and get a $10 gift card). 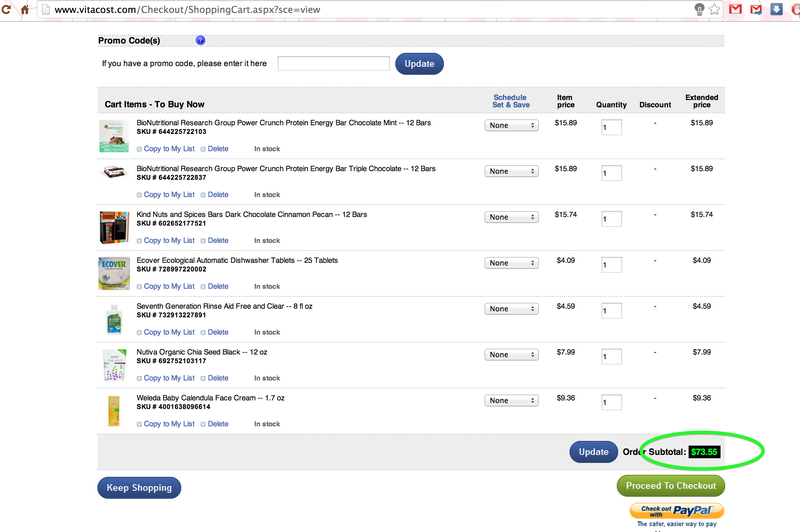 Overall, even though I still order certain things on iHerb, Vitacost gets most of my business due to their lower prices. Stay tuned for more info! 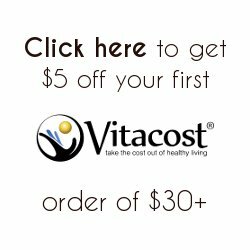 Just a small reminder – you can follow this link (or copy and paste bit.ly/Xn43SB if that doesn’t work) to get $10 off of your first Vitacost order of $30, and you can use code VMC661 for $5-10 off of your first iHerb order of $25+. Enjoy!! !